DHEA (and pregnenolone) can restore blood levels characteristic of youth, enhancing one's immunity to disease, mood, and sexual life. CAUTION: Do not take if you have hormonally driven diseases, prostate cancer or fibroid cysts!! Women who take DHEA could eliminate the need for estrogen replacement therapy by naturally elevating estrogen in the body. To help protect breast cells from excessive proliferation in response to estrogen, women should take 1-10 mg of melatonin at night and consume soy products if they take DHEA. It is suggested that one supplement with antioxidants when taking DHEA. Men should take one capsule of 25 mg three times per day, before each meal. Capsules can be swallowed but better absorption may occur if the capsule is emptied and placed under the tongue for several minutes and then washed down with water. Women need less DHEA. Most women find that a maintenance dose of 25 mg once or twice per day is enough. 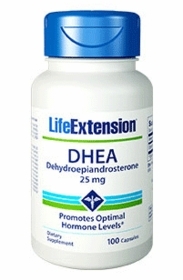 If you have existing liver disease, take DHEA under the tongue to reduce the amount of DHEA entering your liver. Check blood liver enzyme levels to make sure your liver is not getting worse from DHEA. Remember, pregnenolone may be enough to raise estrogen or testosterone levels. We recommend blood tests to determine optimal levels, however based on thousands of blood tests evaluated, anyone over age 40 is already deficient in serum DHEA.